Challenging the Bonsai A to Z entry for Enkianthus (Enkianthus). Native to East Asia and Himalayas. Campanulatus : Upright form with red branches and eliptical, acute, dentate leaves which are green on top and red underneath. Perrulatus : Eliptical, acute, oval leaves which are bright green on top and with long veins underneath. 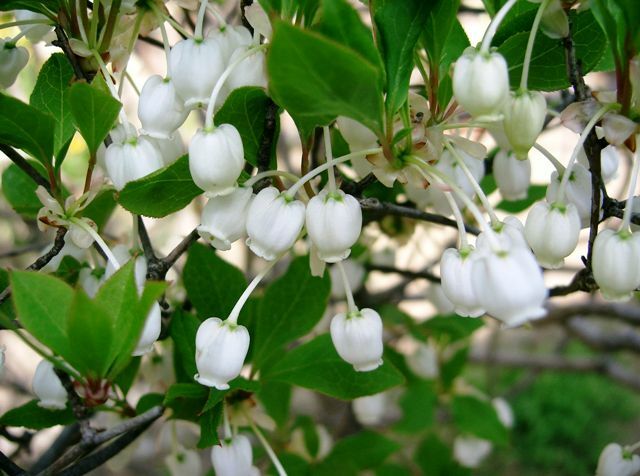 They bear hanging, white, umbellate flowers in April/May before leaves form. STYLE : Suitable for most styles with exception of formal upright, cascade, broom. WARNING : Do not spray the tree when in flower. REPOT : Every 1-2 years in arly spring. Prune roots by one third. SOIL : Requires cool soil rich in humus : forest soil. Cannot tolerate lime but thrives on leaf mould. PRUNE : Prune longer branches in September. Prune sub branches at summers end after flower heads have withered and before new shoots harden. PINCH : No specific requirement. WATER : Water well in summer but slacken off in autumn/winter. FEED : Feed with slow acting organic fertilizer in spring/summer. Liquid fertilizer is best when tree in flower. There are 819 entries in the A to Z and the pages have been viewed 3061150 times. Help us to increase the number of relevant bonsai terms included in this A to Z of Bonsai Terms. We include manufacturers and dealers in the dictionary, if you are one or know of one not mentioned then just click the link above and add an entry. If you have a favourite bonsai tree not mentioned just add an entry. We are trying to create a unique single free source for all bonsai terms and hope to capture worldwide bonsai terms for bonsai trees, bonsai clubs associations and national collections and the A to Z is free marketing for bonsai businesses and bonsai clubs.